Fat Girl to Thin: Biggest Loser, I'm So Happy You Are Back!!!! MY SHOW IS BACK!!!! I have missed it so much and this break was just too long for me. It was only the first episode and was a mini episode at that but it was still so awesome. And I get it the next two days. I wish it would just come on every night. It was so much easier to watch tonight too since I have my new DVR. I didn't know what I was missing. I was able to watch the whole episode and forward through the commercials that I didn't want to see and was able to rewind when I missed something. 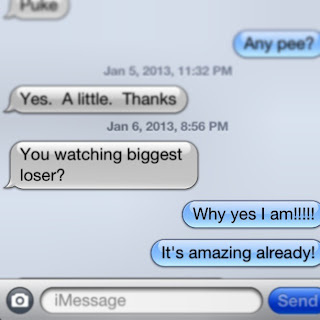 I think Sister 3 might be on the Biggest Loser Bandwagon...she watched tonight!! But sent such a CRAZY text, of course I'm watching!!! I had to take notes during the show because I needed to remember all the people I needed to talk about. First off, I'm so glad Jillian is back, they just need her. I love her philosophy of do the work or leave. And then she kicked 3 out in the first workout!!! hahaha, I loved it! Her team was full of big ol' babies. The two guys were the biggest two crybabies I have seen in years. Don't cry just do, I would have kicked them out of my gym too. Then the blond, good riddance...she just pissed me off. The two brunette were beast and I was a big fan. And finally, I'm so glad to see the wearing of super duper tight clothes has continued...not for the contestants, the trainers and Ally. Good gosh one size bigger please!!! That's a personal thing with me but it really does drive me nuts. I missed some things because I was packing and getting ready for tomorrow. I have decided that I am doing the Dr. Oz Detox and that requires a little prep work to go along with the other prep I do every night before I go to the gym. 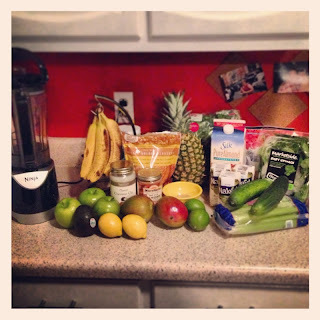 My food for the next 3 days, just blended up and drank! 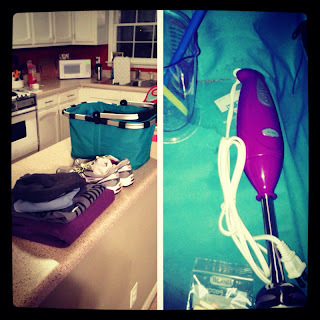 Clothes laid out and I even packed my hand held bender for the occasion. 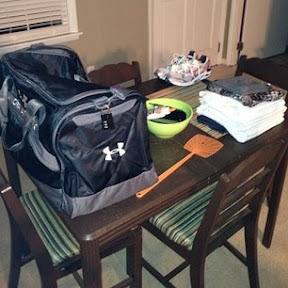 My kitchen table has officially been taken over by my workout stuff. I have to be up early to get all my shakes made and get to the gym. Ill let y'all know how the day goes on my detox. Ill probably post tidbits through the day to Instagram and Twitter so follow along @fatgirltothin on both. I love The Biggest Loser too! Not realistic, dramatized for tv, unhealthy....whatever they want to say, I love it!